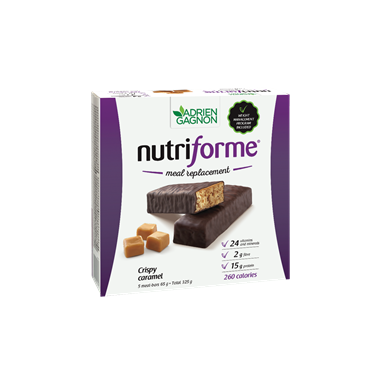 Nutriforme Crispy Caramel Meal Bars are a complete meal substitute supplying essential vitamins and minerals for proper metabolism. Useful in weight reduction only as part of an energy-reduced diet. Directions: Plan provides two ways to lose weight, depending on your goals: Progressive method: 1,400 calories per day, replacing 1 meal. Rapid method: 1,200 calories per day, replacing 2 meals. Ingredients: Protein blend (soy protein isolate, soy protein crisp (soy protein isolate, tapioca starch, salt) modified milk ingredients, pea protein isolate, chocolate flavoured coating (sugar, palm kernel oil, modified milk ingredients, cocoa powder, cocoa powder processed with alkali, soy lecithin, natural flavour salt),corn syrup, caramel fillin ( maltitol syrup, skim milk powder, fractionned palm kernel oil, water, salted butter, cream (cream, milk cellulose gel, milk solid, carrageenan,cellulose gum disodium phosphate, salt,glycerin, natural flavour, soy lecithin, carrageenan), glycerin, natural flavour, cocoa powder processed with alkali, soybean oil, natural flavour, soy oil, glucose-fructose, rolled oats, peanut butter (peanut), gum arabic, peanut oil, peanut floour, raisin paste, natural and artificial flavour, soy lecithin, fructose, potassium citrate, salt, mixed tocopherols. Vitamins and Minerals : Dicalcium phosphate, dipotassium phosphate,, ascorbic acid, niacinamide, zinc oxyde, vitamin A palmitate,calcium d-pantothenate, manganese sulfate, ferrous fumarate copper, gluconate, riboflavine, pyridoxin hci, thiamine mononitrate, folic acid, potassium iodide, biotin, sodium selenite,chromium chloride, sodium selenite, cholecalciferol dl-alpha-tocopheryl acetate, cyanocobalamin. Contains : MILK, SOY and SULPHITES. My husband said these bars are good but he prefers the Yogurt Fruity Delight. We had a problem with the Crispy Caramel bars melting...not sure if this happened with shipping (during the summer) or in our house. Tastes great, my favourite of the 5 I have tried. This one is my favorite of the nutriforme bars (I have tried 4 different kind). Tastes great.